Don’t Say Die Until You Mean It! CAL FIRE Likely Mountain Lookout, Lassen County, State of California, Modoc National Forest, USA. On a clear day you can see 300 miles and into three states, California, Oregon and Nevada. The lookout tower was built in 1958. 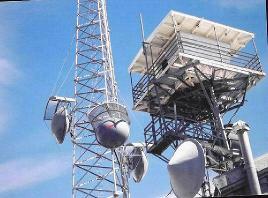 In the early 1980s and continuing through present day, various antennae and towers have been added to the lookout tower and surrounding area. The tower in the background, approximately 40 feet in distance from the lookout tower belongs to U.S. Cellular and was built in 2001. No radiation warning signs were ever posted. during the years the lookout open to the Public. “Me? I don’t worry about it. We all have to die sometime.” I can not tell you how many times I have heard those words or similar such phrases these past several years, smugly uttered by various government employees and other professionals in fields of RF Radiation, Occupational and Public Safety and Medicine. It took me awhile to realize those people either didn’t have a clue as to the actual dangers of RF Radiation or they were applying the phrase to someone other than themselves or they were on the consulting payroll of the corporations selling WIFI services. This site is about Likely Mountain, but it is also about you, me, and your neighbors, as we seem to be the ones the phrase “You have to die sometime,” is being applied to along with another key phrase that I have heard voiced a few more times than I personally would like to hear. “The benefits outweigh the dangers.” Ask yourself. DO THEY? A few of our younger victims all with toxic RF radiation brain and blood cell damage and even tumors. These children will spend decades coping with the damage done to them. God bless our troops! Who through no doing of their own, are now on the front line and facing dangers that most of us can't even imagine! In the Legal World the Courts will generally only accept that a substance is toxic if it is found in studies to affect rats. Sick and dying humans are not enough. A recent study below shows that it does affect rats. Upregulation of specific mRNA levels in rat brain after cell phone exposure. Journal of Electromagnetic Biology and Medicine 2008;27(2):147-54. Adult Sprague-Dawley rats were exposed to regular cell phones for 6 h per day for 126 days (18 weeks). RT-PCR was used to investigate the changes in levels of mRNA synthesis of several injury-associated proteins. Calcium ATPase, Neural Cell Adhesion Molecule, Neural Growth Factor, and Vascular Endothelial Growth Factor were evaluated. The results showed statistically significant mRNA up-regulation of these proteins in the brains of rats exposed to cell phone radiation. These results indicate that relative chronic exposure to cell phone microwave radiation may result in cumulative injuries that could eventually lead to clinically significant neurological damage. Research by Yan JG, Agresti M, Zhang LL, Yan Y, Matloub HS — Medical College of Wisconsin, United States. John Hopkins released a study in June of 2007, stating 100 million people Worldwide, will be affected by Alzheimer’s or similar illnesses by the year 2050. They state it will bankrupt the World economy trying to care for so many long-term-care patients. For us in the United States, the number of victims will translate to approximately 30 million plus people or the equivalent of the all the men, women and children that are presently living in the State of California. Based on those figures, that is my children, your children and everyone else’s children and grandchildren. No one can afford to turn their backs this upcoming disaster. John Hopkins is looking for some way to save as many of those future victims as they can. We believe that if we can get the word out as to what happened at Likely Mountain and the side effects we have suffered, lives can be saved. You can and we can make the difference if we work together. Please pass on our website address to everyone you know. You can not protect yourself from what you don’t know. BRAIN and THYROID DAMAGE. TUMORS. Fifteen of sixteen Likely Mountain RF radiation exposure victims tested to date, have been found to have toxic RF radiation brain damage, i.e., cell death and blood cell damage. Ten out of the sixteen have tumors or have had tumors removed. How did this happen? It happened because California State employees have immunity and therefore are not held accountable for their actions . They get FREE LEGAL representation by JERRY BROWN, paid for by California Taxpayers. California State voters. Never cast another vote for Jerry Brown. The man has helped cover up the death and injuries at Likely Mountain, by fraud and perjury. of the Vietnam era, I don’t see how I can leave out Agent Orange. A lot of our Vets have died or are disabled because of Agent Orange and there are thousands of children that were born with birth defects because of their father’s or in some cases mother’s exposure to Agent Orange. For years our Government said the Vets were wrong that Agent Orange was not at the root of their health problems and which does include thousands of cases of Cancer. Only in recent years have they admitted or confessed that indeed the stuff was toxic and it did lots of harm to those that were exposed. or do it the tried and tested way by mail. Int J Pediatr Otorhinolaryngol. 2009 Mar;73(3):391-9. Epub 2008 Dec 23. Effects of intrauterine and extrauterine exposure to GSM-like radiofrequency on distortion product otoacoustic emissions in infant male rabbits. Budak GG, Muluk NB, Budak B, Oztürk GG, Apan A, Seyhan N.
Gazi University, Faculty of Medicine, Nanomedicine Research Laboratory, Ankara, Turkey. 7 days in the intrauterine period (between 15th and 22nd days of the gestational period) (intrauterine-IU). reached to 1-month of age (IU+EU). The cochlear functions were assessed by DPOAEs at 1.0-8.0 kHz. of the anatomical structure in infancy.